Nov. 29–Nov. 30 (11 a.m.–5 p.m.) Join us for new releases, holiday gifts and more. Pick up a bottle, a case or a magnum of our critically acclaimed 2012 Pinot Noir. Add a jar of Italian Truffle Honey, some Duck rillettes, and you’ll be the star of the season. Sample before you buy, we insist. Fee: $15. Nov. 28–29 (11 a.m.–9 p.m.); Nov. 30 (11 a.m.–6 p.m.) We’re blowing out all the stops for our post-Thanksgiving Day Wine Weekend. Admission gets you a taste of EVERY wine we make, appetizers, live music and a logo glass. Why drive all over wine country when you can try it all in one place at our cozy Southeast Portland winery. Don’t feel like imbibing? Non-drinkers/designated drivers are welcome at the discounted rate of $7.50--you can still nosh on the food, listen to music and enjoy some complimentary non-alcoholic beverages. A portion of all Admissions will be donated to Our House of Portland and local artisan jewelry company Nicolas Stone will be on site and donating a portion of all jewelry sales to Our House as well. Fee: $15 (includes wine glass). Nov. 22 (3–7 p.m.) Join us as we celebrate Pre-Thanksgiving Weekend surrounded by great wine, good food, and a beautiful city at SE Wine Collective for the third annual Urban Thanksgiving. Event includes up to 25 wine pours from ten different winemakers, braised turkey tacos with wine-friendly toppings inside the winery. 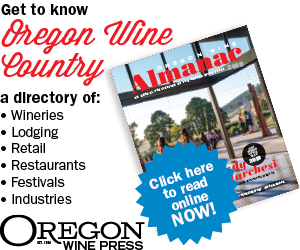 The winemakers behind Vincent Wine Company, Helioterra Wines, Division Winemaking Company, Willful Wines, Jackalope Wine Cellars, 5Q, James Rahn Wine Co., Jasper Sisco, Ore Winery and Fullerton Wines will also be on hand. To make a reservation, visit the S.E. Wine Collective website. Fee: $18 (advance); $20 (door). Nov. 28 (3–7 p.m.) Black Friday Wine Down Party. Join us after (or instead of) shopping for wine tasting, small bites and specials. Nov. 28–30 (noon–6 p.m.) Come check out our new Portland tasting room while trying out our newest releases. They will include our first Tempranillo, our most recent Claret and Petite Sirah, while also previewing our next Malbec, and a couple of new varietals: Anyone heard of Alicante Bouschet and Mourvèdre? Fee: $5. Nov. 28–30 (2–10 p.m.) Gobble up 20 percent off all house wines and 15 percent off all other wines all weekend long. Just mention this ad. Fee: none. Nov. 28–29 (noon–7 p.m.) Viola will be pouring current releases at cork, our tasting room on N.E. Alberta Street. Come check out the latest Barbera d’Alder, the new Dolcetto d’Allegre and the popular Alberta Rosso. Three reds to warm you up this winter. Fee: none. Nov. 22–23; Nov. 28–30 (11 a.m.–4 p.m.) Join us for our Thanksgiving open house and complimentary tastings on all of our wines. Join us for our Pre-Thanksgiving open house, too. Fee: none. Nov. 26–30 (noon–5 p.m.) This weekend 10 percent of proceeds go to Oregon charities and nonprofits. Taste the wines in the old bank vaults — originally built for the 1905 Portland World’s Fair. Taste our limited-edition Walla Walla wines — the 2009 Walla Walla Cabernet and newest edition of Bank Robber Red, a criminally good blend of Merlot, Cabernet and Petite Verdot. Fee: $5. Nov. 28–30 (noon–5 p.m.) St. Josef’s is one of the pioneering wineries in the Northwest with vineyards planted in 1978 and first legal vintage released in 1983. Specializing in food-friendly estate-grown wines at reasonable prices. “Of all of the picturesque wineries in the Willamette Valley … we’ve yet to find a better place to sip,” —Portland Monthly Magazine. Fee: $5. Nov. 29 (1–6 p.m.) New release of 2009 Zinfandel, 2012 Carmenere and Signora In Rosso. Entertainment by Aaron Meyer and Tim Ellis. Fee: $15 (includes wine glass). Nov. 28–30 (noon–5 p.m.) Join us in the tasting room Thanksgiving Weekend to celebrate the harvest season. We will be releasing our 2012 Syrah and offering discounted case and half case prices on select wines. Fee: $5. Nov. 28–30 (appt. only) Mt. Angel Cellars & Vineyards will be open by appointment only during the holiday and rest of this year. Nov. 28–30 (11 a.m.–5 p.m.) Chris Carlberg pours six Pinot Noirs and six white wines, plus an assortment of wood-fire pizzas. Fee: $10 (waived with three-bottle purchase). Nov. 28–30 (noon–5 p.m.) Tasting nine wines, including new release of 2012 Chardonnay. Light snacks. Special Thanksgiving Weekend discounts. Fee: none. Nov. 28–30 (noon–5 p.m.) Come see our beautiful vineyard, visit our tasting room and sample our unique, fabulous North Willamette Valley estate wines. Fee: $5. Nov. 28–30 (1–4 p.m.) Villa Catalana Cellars will open Thanksgiving Weekend. View the tropical plants in the conservatory tasting room as you sip a glass of Pinot Noir. Fee: $10. Nov. 29 (noon–5 p.m.) We invite you to visit us during this rare, one-day-only opportunity to sample our current vintage Pinot Gris and Pinot Noir wines. Fee: $10 (waived with purchase). Nov. 28–30 (noon–5 p.m.) Enjoy our unique selection of wines while listening to live music by guitarist Kit Karoutte, from 1-5 p.m. Food available from Seven Brides Brewery. No charge for wine club members. Fee: $10 (includes wine glass). Nov. 28–30 (noon–5 p.m.) Enjoy wine tasting at our fourth-generation family farm. We make 100 percent estate wines. Special holiday package: six years of Hanson Vineyards estate Pinot Noirs from our library. Great case discounts. Fee: $3 (waived with bottle purchase).